Last time, I listed what I hoped to learn at the Tru2Way Developers Conference: A realistic workflow and launch plan for developers, and that fears of the “rogue app” won’t stunt progress. Here’s what else I learned at the conference, which ran last Saturday and Sunday, prior to the annual Cable Show, in New Orleans. Hardware first. If you’re a marketer wondering how to help sell those tru2way HDTVs that will retail into some cable markets this fall, know this: Consumers are “resoundingly interested” in digital cable without the set-top box. Panasonic, which hosted the research, noted that an unusually large percentage of consumers surveyed said they’d be very likely to buy such a set. Why will people fork over a couple hundred extra dollars for a TV with a built-in set-top? Three reasons: No monthly set-top rental fees. No futzing with wiring. One remote control, not two or more. As for a national tru2way footprint: Pay attention to that word “capable.” As in, “tru2way-capable.” Back when operators were going from 550 MHz to 750 MHz, amplifiers were often described as being “750-capable.” It meant that there was an empty slot in the housing, for the module that would plunk in the extra bandwidth. Same thing for “tru2way-capable” and “OCAP-capable.” It means the boxes have enough room, in terms of processing power, to accommodate the middleware. It does not necessarily mean that it’s been loaded and activated. Taking an amplifier from “capable” to “activated” meant sending someone to it, opening it, and physically installing the thing. Where you are depends on whether you’re a glass-half-full or a glass-half-empty person. At the 2008 Cable Show in hot, humid New Orleans, I interview five participants in the CableLabs “CableNet” exhibit area. In order of appearance: Samsung’s Steve Goldstein, who demonstrates the latest in 3DTV; Synacor’s Jim Turner, discussing remote DVR scheduling; Michael Hawkey, demonstrating Sling technology; and David Nicholas, discussing how technology from Symmetricom can replace traditional “golden eye” video testers. Produced by the fabulous David Knappe with equally fabulous Joe Bondulich on camera and lighting. At the 2008 Cable Show, I interview five participants in the CableLabs “CableNet” exhibit area. Up first: Samsung’s Steve Goldstein, who demonstrates the latest in 3DTV. 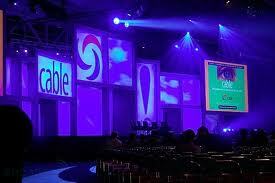 At the 2008 Cable Show, I interview five participants in the CableLabs CableNET exhibit area. This segment features Jim Turner (2:40), VP of Synacor, on the use of DVR-like controls on Charter.net’s web site. At the 2008 Cable Show, I interview five participants in the CableLabs CableNET exhibit area. This segment features Hans Pang, of Ruckus Wireless, explaining the company’s smart antenna array that allows multiple streams to run wirelessly. At the 2008 Cable Show, I interview five participants in the CableLabs CableNET exhibit area. This segment features EchoStar Technologies’ Michael Hockey, discussing a Slingbox with built-in DOCSIS 2.0 cable modem. Intent: To allow subscribers to access subscription video channels on laptops, cell phones, or other mobile devices. For the two weekend days leading into this year’s Cable Show, the ITV-interested will again gather to hear the latest in “tru2way,” the consumer-facing re-brand of the OpenCable Applications Platform, or OCAP. This mission is not without challenges. Those challenges have nothing to do with fear of commitment by cable operators. Here’s why: In the last three years, since U.S. cable operators committed to outfitting their systems and set-tops with unified middleware, two things happened. The good and strategic was the sudden priority of 2005: The digital simulcast. By replicating entire analog cable lineups in digital, all channels (and their ads) are now fair game for interactivity. This is good. It’s often over-looked, but it’s still good. If the digital simulcast hadn’t happened, the number of channels and shows eligible for tru2way applications would be substantially smaller. The bad and regulated was the July ’07 ban on integrated security, even in the set-tops cable providers buy and lease to their customers. Complying with that rule poured molasses on most cable video advancements — and erased at least a year from the tru2way-ing of America. Instead, the challenges for tru2way and developers are more about structure, scale, and fear. That’s why I hope to learn of an actionable workflow for those supposed zillions of Java developers, itching to build cool stuff for cable-delivered TV. Some kind of clearinghouse for Developer Jane to test and certify her app, so that it can be approved to run on cable. And what about a clearinghouse destination, like Handango.com is for mobile phone applications? Mobile carriers are similar to cable operators, in that they built, own and manage their own networks. They worry about rogue applications that could bring the network down. They aren’t set up to individually vet application ideas from millions of individuals. Some found a way around it, though, by putting both approved and “at your own risk” applications on a phone-accessible web site. I also hope to learn whether there are enough “un-bound” applications — uncorrelated with the show you’re watching — to attract developers. Let’s face it. So far, bound applications are sexier. They let people impact the outcome of a show. If bound apps are Ginger, it kind of works that unbound applications are Marianne: Necessary. Sensible. Pretty in their own way. Not Ginger. Mostly, I hope to learn that the fear of that unknown and rogue application won’t stunt the action around good interactive TV.